Election Voting System Gujarati.. Salbro Engineers Mumbai. The Union Co-Op Bank Ltd Naroda Ahmedabad. Election Day: 21st Jan 2018 Election conducted by Salbro Engineers using "Election Voting Machines"
The Electronic Voting Machine (EVM) is a voting system completely developed In-House jointly by Salbro Engineers and Base Technologies. Both these companies jointly handle projects and operate from the same premises in Mumbai, India. Our EVM’s are Government Test Lab certified and are one of the most sort-out piece of equipment available in the market today. Reading through this catalogue will help you know about the features this product has to offer.Our system is accurate, robust, user friendly and “Is performance” driven in its operations. 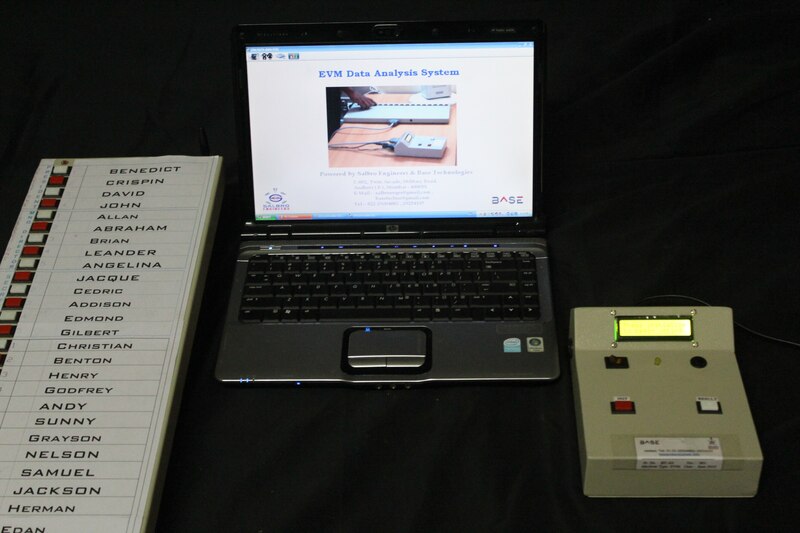 EVM Features 1) Controller based system of Voting in comparison to Previous Ballot Paper Voting. 2) Tamper Proof. No influence of radioactive waves, electromagnetic waves etc 3) Electro – Mechanical buttons are used in the ballot units 4) Registering of votes is instant. Saves time and cost. Field configurable: Configure the EVM via Evm_App software to set 1) No of Candidates contesting elections 2) No of Categories (upto 11 Categories) OR no category 3) No of votes the voter is permitted to cast. 4) The system does not allow the voter to vote twice for a candidate. 5) Compulsory/Not compulsory voting. o Should the voter cast all permissible votes or Not? o No of winners to be selected from each category Pc/Laptop is connected to EVM control units only to configure them before voting starts and for retrieving of vote data after election ends else the EVM system works independently. A total of 65, 000 voters can cast votes in one EVM. 65, 000 votes for each candidate can be cast. Basic model of our EVM accepts up to 16 contestants /candidates in the race. Exceeding 16 candidates we cascade/ attach additional Ballot unit of 16 buttons each. One EVM control unit can handle up to 64 candidates. No loss of voting data even in the case of power failure. No invalid votes can be cast Voting data is stored in memory chips and the data is stored for decades. Memory chips can only be erased by authenticated users only via the PC/Laptop “Evm_App” software. Transfer data from Evm Control Units to Evm_App for consolidated reports, excel exports. Encoded / Encrypted files can be uploaded unto server in a secure manner. Reusability. Conduct voting even in the absence of electrical supply. Eco Friendly. PC Software – EVM Data Analysis The PC software is a windows based desktop application and it provides the user with a graphical user interface in Requesting stored data from all controls units. Configuring the EVM in setting the No of Candidates contesting elections. No of Categories  (11 Categories in all) OR no category No of votes the voter is permitted to cast. Compulsory/Not compulsory voting No of winners to be selected from each category Setting the communication Port for hand shaking between software and control unit. Receiving data from control units, decoding it and saving data into respective encrypted files. It does not consider data from the same unit even if multiple requests are made. It outputs a consolidated report considering data from all units that were connected to PC. Applications o Co-Op Hsg Societies for Managing Committee. o Co-Op Banks . o Associations n Trusts (Board n Trustee selections) o Corporate Companies (Board, Secretary n Chairman selections) o Panchayat & Municipal elections. o Schools, Colleges & Universities. o General n Assembly elections & any other election. Services We also provide services like conducting and supervising elections until Election Result is declared.